Adam Schacter (bald, right) negotiating a 1st-place chop. Kinda fun … with action still grinding away at the big table, our boy Adam Schacter just won the nightly. Nice! (And making a final table is always a good way to become “our boy”, fyi.) Actually he chopped when they were down to three players … but as the chip leader in that situation, he gets credit for the win and takes home more than $3k. Second place got about $2,700 … with third getting about $2,000. 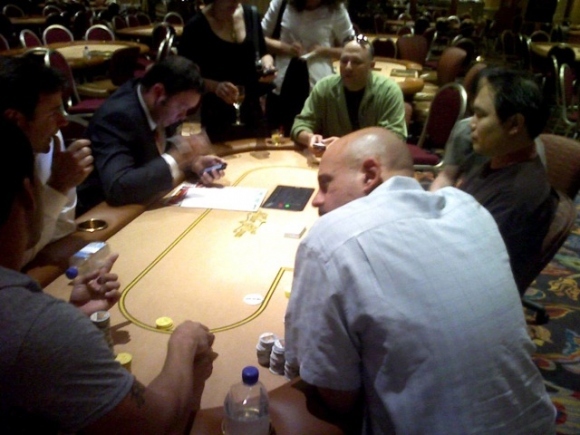 Schacter, of course, is an ancillary Batface (kinda like a “Friend of Full Tilt”) who made four final tables in Pokerati Invitationals and DSOP’s. He was in town for a wedding and hadn’t played poker since August when he bought into this $120 event on a whim.